(From Nikon lens literature) Nikon has announced the new AF-P NIKKOR 70-300mm f/4.5-5.6E ED VR, modernizing this popular zoom lens with a myriad of the latest Nikon technologies. The new lens features enhanced Vibration Reduction (VR) image stabilization capability and integrates a stepping motor for fast and quiet AF performance, making it Nikon's first full-frame AF-P lens. This new NIKKOR lens is a versatile, compact telephoto option for intermediate FX and DX-format photographers looking to capture sports, wildlife, candids, travel and other subjects at long distances, all with stunning clarity. "This latest lens reaffirms Nikon's commitment to giving FX-format shooters of all levels the unparalleled quality of NIKKOR glass, with the benefits of our latest optical technologies," said Kosuke Kawaura, Director of Marketing and Planning, Nikon Inc.
Lightweight with Stepping Motor Technology: This AF-P lens uses a stepping motor for fast and quiet autofocus, which reduces the sound of lens operation while recording HD or 4K UHD video. This new technology also contributes to the lens' reduced weight, making it easy to carry on all-day excursions. The Nikon AF-P NIKKOR 70-300mm f/4.5-5.6E ED VR lens will have a suggested retail price (SRP) of $699.95**, and availability will be announced at a later date. * Based on CIPA Standard. This value is achieved when FX-format compatible lenses are attached to a FX-format digital SLR camera and zoom lenses are set at the maximum telephoto position. ** SRP (Suggested Retail Price) listed only as a suggestion. Actual prices are set by dealers and are subject to change at any time. 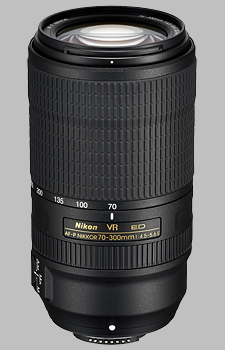 The Nikon 70-300mm f/4.5-5.6E ED VR AF-P Nikkor doesn't have any user reviews yet!